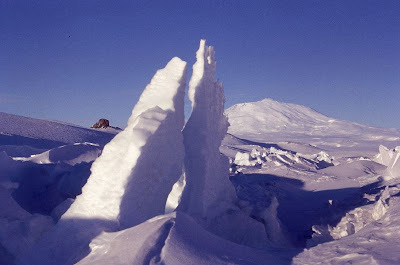 As a young boy I used to enjoy listening to Radio New Zealand’s programme Antarctica Calling on a Sunday evening when all the New Zealander’s at Scott Base could talk to their families. Why was I so interested? Cherrie Martin was in my class at High Street School in Dunedin and she was the most beautiful girl in my class. And to elevate her status even higher, her Father was part of the New Zealand (IGY) International geophysical Year team and wintered over at Scott Base with none other than Sir Edmund Hillary, the leader in 1957-58. These were my heroes. No one talked of global warming in those days. The 1957-58 International Geophysical Year (IGY) was highly successful. Successes credited to IGY include the discoveries of the Van Allen radiation belts that surround the Earth, and the launch of Sputnik, the world's first artificial satellite, IGY was also said to be fundamental in establishing the Antarctic Treaty, an international agreement that designated the region as a continent for peace and science. Eleven years later I was in Antarctica as a Scientific Technician carrying on the work the scientists of IGY started. I wintered over at Vanda staion in the Wright Valley in 1970 with three other people doing scientific work; mainly meteorology, ice measurements on Lake Vanda, seismology and geomagnetics. 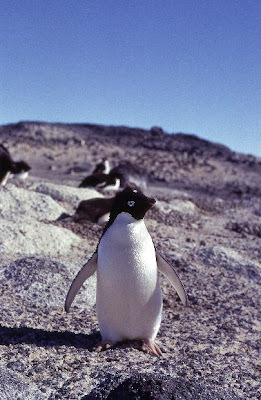 I spent 13 months in Antarctica between Oct 1969 and Nove 1979 and the work we started. showed that changes were occuring in Antarctica's temperatures and the ice on Lake Vanda was ablating at an alarming rate. Also we witnessed the largest river in Antartica, the Onyx, which flowed into Lake Vanda, inceasing in flow over two summers. We probably were some of the first to measure the beginning of global climate change. 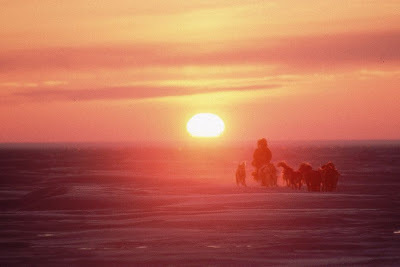 In 1986 I joined Will Steger's International Polar Expedition. 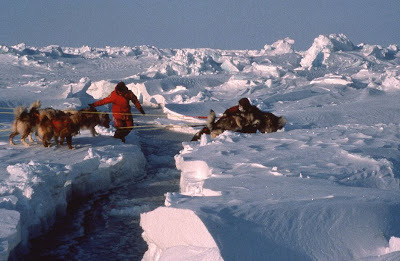 Here we are guiding sledge dogs across open leads on the Arctic Ocean en route to the North Pole. 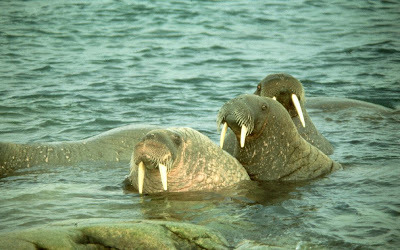 It was clear on our two Arctic expeditions in 1985 and 1986 we were seeing dramatic changes to the Arctic environment, but we didn't quite understand the full extent of it. Today Will Steger is one of the leading advocates for global warming in the Polar regions. Photo: Will Steger. For the last two years, one of the largest international research programmes for 50 years has been focusing on the world's most remote regions - the Antarctic and Arctic. IPY was officially launched in Paris on 1 March 2007, and will run until March 2009. The International Polar Year (IPY) brings together thousands of scientists, from more than 60 nations, to participate in more than 200 projects. And the issue at the top of the agenda is climate change. "This is going to raise the profile of the issue of global warming among the international community," said Sir David King, the UK government's chief scientist at the opening. "We know that what is happening to ice on the planet is a very clear indication of what is going to happen to the rest of us. The first IPY, held in 1882-83, saw the world's first co-ordinated international expeditions to the polar regions. 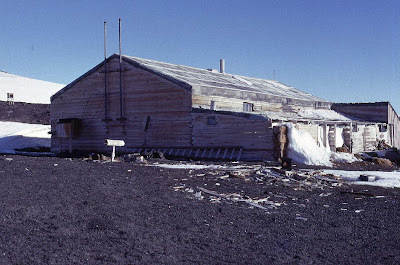 In 1932-33, the second IPY led to 40 permanent observation stations being established in the Arctic. Royal Society president Lord Rees, speaking to reporters, said the fourth IPY would build on scientists' current knowledge. "Polar regions are clearly the focus of even more interest than they were 50 years ago when those of an older generation remember the previous International Geophysical Year. "That is because of a number of reasons," Lord Rees explained. "They are the most pristine and least explored parts of the planet. "Climate change is also more manifest here than anywhere else, and some of the best data on the climate comes from what we get from the ice cores." Cynan Ellis-Evans, head of the UK's IPY national committee, "The IPY is going to be taking this large number of nations and work together," he said. 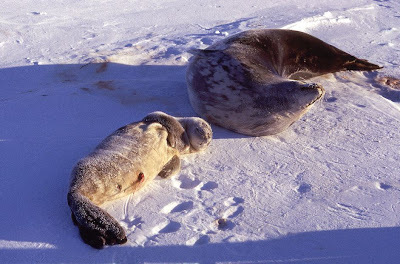 "One classic example is the Census of Antarctic Marine Life, involving 18 nations." The project will investigate the distribution and abundance of marine biodiversity in the region, and aims to provide a benchmark against which future changes, including climatic shifts, can be measured. "The whole of the Southern Ocean is going to be covered, and this sort of activity would never have been possible outside of the IPY," Dr Ellis-Evans added. At the beginning of February, the Intergovernmental Panel on Climate Change (IPCC) published a summary of its Fourth Assessment Report, which showed that human activity was "very likely" to be causing climate change. But it added that uncertainties still surrounded some of the projected impacts, such as sea level rise caused by melting ice-sheets. One of the speakers at the launch in London said that the IPY would address these issues. Eric Wolff, principal investigator for the British Antarctic Survey, used a musical analogy to make his point. "Scientists study these things all the time but the way I like to think of it is that individual musicians sound interesting to listen to," Dr Wolff said. "But it is only when you put them all together with a conductor in an orchestra that you start to hear something fantastic. "And that is what the IPY is going to do; it will allow us to look at the whole in one go and get a snapshot." Stirling University experts are currently working in the Arctic on a fact-finding mission to aid the fight against climate change. 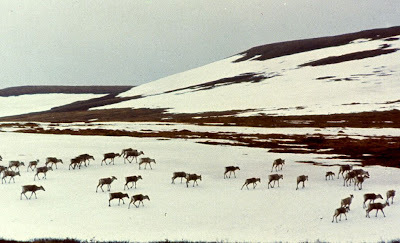 Concerns have been raised that the high amount of carbon found in Arctic soils could be released into the atmosphere. The university's Dr Philip Wookey, leading the Arctic team, is investigating the decomposition of organic matter in soil and how the process is affected by environmental change. 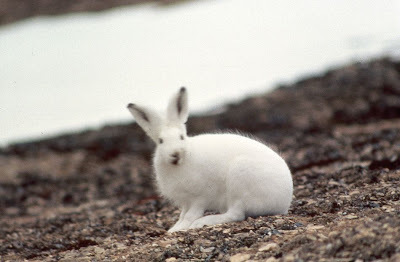 Dr Wookey said: "The polar regions are predicted to undergo the most rapid climatic changes as a result of the greenhouse effect, and the organisms that inhabit them may also be especially vulnerable to change. "Another frequently ignored issue is that the Arctic stores enormous amounts of carbon in soils. "There are real concerns that much of this carbon could end up in the atmosphere in the form of carbon dioxide and methane, which are both powerful greenhouse gases." The International Polar Year has been launched by scientists across the world to address environmental concerns affecting the polar regions. 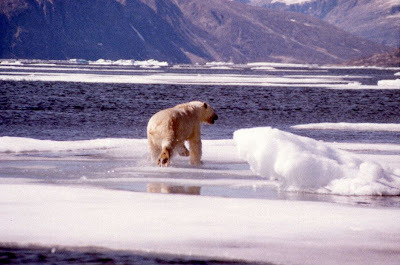 Polar bear numbers diminish as the ice cover on Arctic Ocean shrinks in size. The loss of polar bears to be a "canary in the coal mine" signaling the need for stronger action on mitigating global warming. This week has been an inspirational one for me. Currently we have over 2000 Red Cross volunteers camped in West Java, Indonesia. Most of them are from Indonesia, with smaller numbers from China, Germany, Netherlands, Bangladesh, Hong Kong and Malaysia. It is a camp to learn and improve skills. 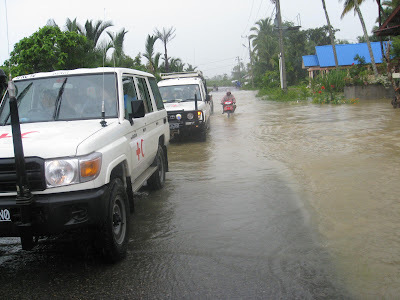 Apart from disaster response and first aid training, a lot of emphasis is being put on Climate Change which is becoming an integrated part of Red Cross programmes in many parts of the world. Red Cross has its own Climate Centre in the Netherlands. 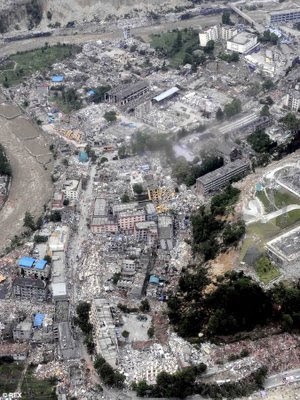 Disaster risk reduction tends to be cheaper and more efficient than emergency relief. Unfortunately, the lack of dramatic images causes disaster risk reduction to receive less media attention than disasters which require immediate relief, and thus disaster risk reduction programs attracts fewer sponsors. The resulting absence of funds seriously halts the development of local and regional disaster risk reduction programs, particularly in developing countries. Since there are few humanitarian organisations which prioritise disaster risk reduction to the extent the Red Cross/Red Crescent does, it is up to the Red Cross/Red Crescent to advocate the importance of disaster risk reduction to both the general public and policy-makers. The necessity of being prepared for climate change and extreme weather events constitutes an important additional argument in favour of this campaign. How can you help the fight against global warming in the Polar regions, and the rest of the world ? The RC/RC Climate Centre is part of the International Federation of Red Cross and Red Crescent Societies. The Climate Centre is not a government agency, but depends on donations to carry out its work. You may donate either to the National Red Cross or Red Crescent Society in your country or to the RC/RC Climate Centre. My good friend of two polar expeditions, Will Steger, is one of the leading advocates on climate change in the Polar Regions (click here to read more). The Will Steger Foundation has seen firsthand the dramatic effects of climate change on both the environment and the human condition through the efforts of its founder, Will Steger, who has explored the Polar Regions for 45 years. With that knowledge, WSF is leading humanity to slow climate change. The Foundation seeks to inspire and be a catalyst for international environmental leadership to stop global warming through exploration, education and action. The grave digger of Kabul. 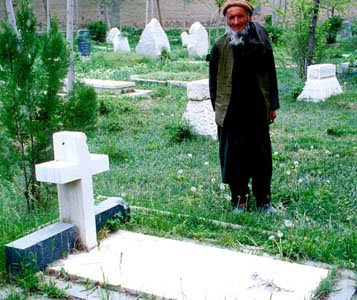 It was a cold winter’s day in early 1994 when I first met Rahimullah, grave digger and caretaker of the British Cemetery in Kabul. He looked poor in tattered Shalwah Kamez and a shawl wrapped round his shoulders to keep out the biting cold. The headstones and graves were dusted with snow. In the distance the Hindu Kush range stood high above Koh Daman, the hills that skirt Kabul. Rahimullah looked about 50 then. Since the Soviets withdrew from Kabul in 1989 he hadn’t been paid. 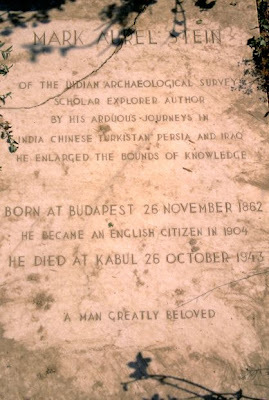 I knew that Aurel Stein, the famous Hungarian born British Archaeologist was buried here in 1943. I didn’t know that this would to prove to be the most interesting grave yard I had ever seen. 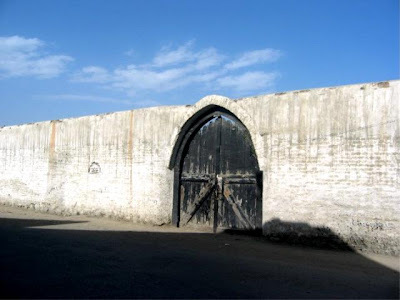 Its oldest residents are British soldiers from the Anglo-Afghan wars. Like the 29 members of the 67th Foot (South Hampshire Regiment), buried in a mass grave after a failed attempt to climb a hill south of Kabul on the 13th December 1879. All that really remains of them is part of their grave stone, stuck along one side of the cemetery wall with other fragments of history. Long lists that tell no stories other than the staccato military details of name, rank, regiment and date. In between are assorted ranks of other visitors who never made it home. Explorers, journalists, hippies who lost the trail, engineers and aid workers; Italians and Germans and Canadians and Polish and many from other countries. 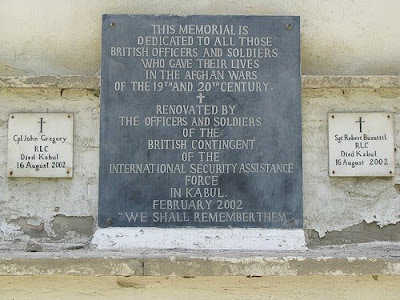 Their headstones tell a snippet of Afghanistan’s rich history. Raimullah hadn’t been paid for four years when I first met him and I was so impressed that he still kept the grave yard tidy after 3 years of heavy fighting that I got a few friends together and we paid him a monthly salary for the next few years. He knew every grave and the history behind it and over a period of almost 3 years, we became good friends. I often used to sit on a grave and he would tell me about his life, his thoughts on Islam, why he tended the graves of Infidels. 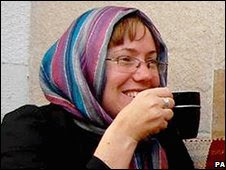 I had almost forgotten about old Rahimullah, when I saw the tragic news on the BBC news on Monday night, 27 October about Gayle Williams, 34, who worked with disabled children for the charity Serve Afghanistan, was gunned down by two men on a motorbike as she made her way to work on Oct 20. The Taliban claimed responsibility for the killing, saying that she had been targeted because she was "preaching Christianity" -a charge rejected by her colleagues. Her mother Pat and sister Karen were among around 50 expatriate colleagues, friends and diplomats who gathered to mourn Gayle Williams at the Afghan capital's historic British cemetery. Rose petals were scattered on her coffin, which was decked with flowers, as she was buried. Miss Williams had asked to be buried in Afghanistan should she die in the country. The ceremony was protected by a cordon of police, with roadblocks set up to prevent a possible attack. Her relatives then met President Hamid Karzai at his palace afterwards. I am sure Rahimullah was there. He would have carefully dug the grave and tenderly tended her plot after the family and crowds departed. Gayle William’s burial must have been one of the biggest ever to grace that famous green plot, excepting that of Aurel Stein. The rich dust of those infidels has fertilized a rare green space under Rahimullah’s care and he will lovingly care for them as long as he can. Gibbons, houses, nursing colleges, hospitals, schools, TRIAMS and lessons learned. I finally have a few hours to write after a frantic last 10 days. I am flying from Bangkok to Jakarta and we are presently over the Gulf of Thailand, and in the distance, I can see the city of Hat Yai. This time a month ago, I was travelling from Bangkok to Penang in Malaysia by train and passed through Hat Yai. It looks so different from the air. Ten days ago I flew to Aceh which was the scene of enormous destruction during the Indian Ocean tsunami, with over 250,000 people killed or missing. I visited the Island of Pulau Wei, saw the houses, a wonderful hospital and a busy school constructed by the German Red Cross, and a nursing college build by the Norwegian Red Cross. The nursing college runs a three year course and produces top quality nurses, something there is a shortage of in Indonesia. 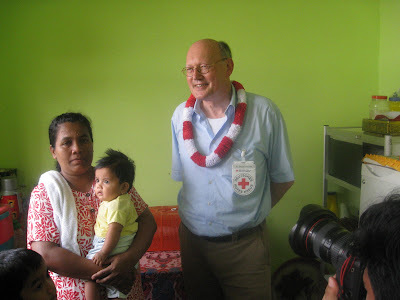 Later I visited houses constructed by the Netherlands Red Cross. 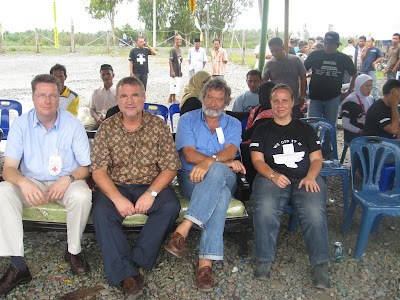 Then on the following day,I accompanied my German Red Cross colleagues to the opening of a large secondary school in Banda Aceh, which caters for 700 plus pupils. here we spent time with the pupils and saw a high standard of education be given by dedicated teachers. We also saw an innovative German Red Cross programme which uses smashed furniture and other pieces of debris washed up by the Tsunami, to make furnture for the school and other public buildings. Nothing is wasted in Aceh. The next day, Sunday 19 October, I travelled down the spectacular coastline from Banda Aceh, to Lamno, Calang and Teunom with Martin Hahn, from the German Red Cross HQ in Berlin. We stopped for a break near Lamno and I bought a coke. 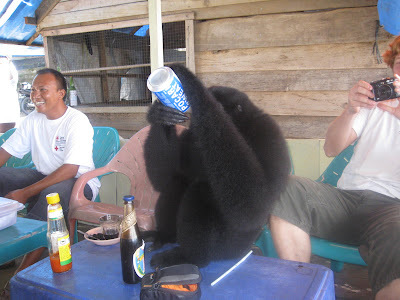 As I was drinking it a large Gibbon swung through the jungle, sat on the table, swiped my Coke, and gulped it down. Next, he picked up Martin’s drink and downed that too. He didn’t appear aggressive so I engaged in a conversation with him but he didn’t reply to my questions, but looked quizzically at me. We passed many of the 20,000 sturdy transitional shelters built by the Red Cross to tide people over until permanent shelters were built. We have completed 16,000 of the 20,000 permanent houses houses now and the transitional shelters are attached to the rear of the new house and either become an sxtra bedroom, kitchen, or houses someone from the extended family. En route I saw houses built by the Indonesian, Chinese, Canadian, British and German Red Cross, with many of them with top class water and sanitation facilities. Most of the water and sanitation has been done by the American Red Cross including a massive municipal water supply in the city of Calang. My role as Head of Delegation of the International Federation is to coordinate the programmes done by our members Red Cross and Red Crescent societies and to represent them at senior level with government, provincial governors, the UN and other agencies. I also have a role in monitoring and evaluation. Field trips are an essential part of my work. Last Sunday as we drove to Calang, it started raining heavily. By nightfall we had torrential rain and we had to evacuate 28 of our Canadian Red Cross colleagues from their flooded compound to ours. 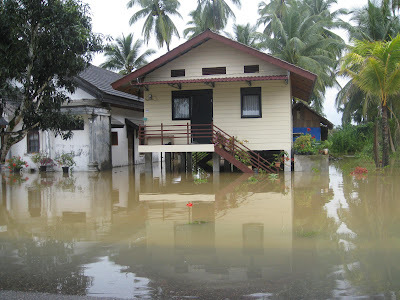 While this wsa going on, my fears were for the people living in the houses we had built and I went to bed thinking, "will they be dry, safe and sound tonight?" 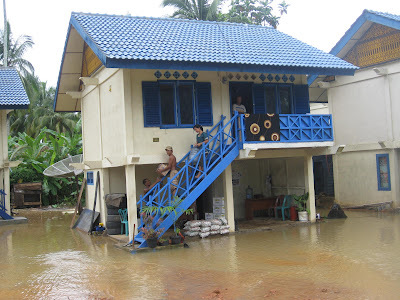 The next day we had wide spread flooding in Calang and Teunom, the worst in years, and even the main road which is many metres above the surrounding land, was flooded. I need not have worried about the houses the Red Cross built. Not are the earthquake resistent, they are flood proof too. I was so proud of the housing designs of the Canadian, British and German Red Cross, as the houses were well above the rising flood waters. I spoke to a women in one house and she said she felt so safe in her Red Cross house. It is hard workers Heike Kemper, an architect and leader of the German Red Cross team in Teunom, who has worked tirelessly for years ensuring that the houses were built to the most stringent standards. After inspecting a few houses I joined Martin Hahn and the German Red Cross team for a handover ceremony for 690 houses midst flood waters and pouring rain. From l to r. Martin Hahn, Bob McKerrow, Dirk Schuemeister, and Heike Kemper at the handover ceremony for 690 houses. Few people understand the enormity the work the Red Cross has done in Indonesia. We have spent over a billion US dollars and have built 40,000 houses, hundreds of schools, medical facilities, water and sanitation systems, markets, community centres, nursing colleges, mental institutions, bridges, dykes and mangrove plantations to protect land against rising sea levels, ice plants for fisher people to export their fish and lobsters to the more lucrative markets, plus many other livelihood programmes. We also conduct long term community programmes such as disaster preparedness, community based first aid, psycho social counselling and other risk reduction programmes. Most of our work is done in support of the Indonesian Red Cross to build the capcity of this outstanding society that has almost a million volunteers nation-wide. Since the Tsunami operation, began in late 2004, the economy of the province has improved dramatically. 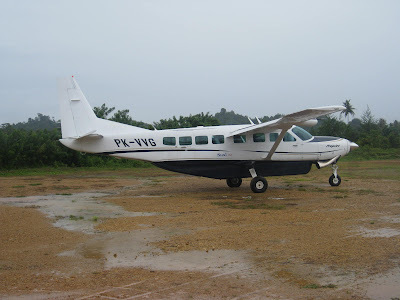 Small airlines like Susi Air provide transport from remote areas like Simeulue and Nias. 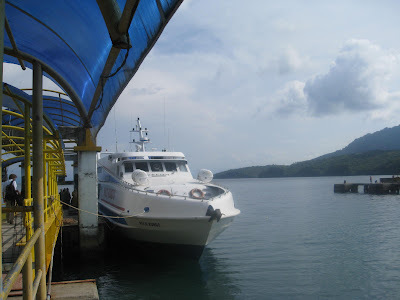 Islands and Calang to Medan. Air transport enables lobster fishermen to get doluble the price of the catch now. Last Wednesday I flew to Bangkok for a Tsunami Lessons learned Project Meeting of Country Programme Leaders and Champions. Representatives came from the Governments and UN system in India, Maldives, Sri Lanka, Indonesia and Thailand. Jerry Talbot and I represented the Red Cross Movement. With so much money having been so generously given by ordinary people from around the world, transparency. quality and accountability are essential elements and this is where Governments have put strong anti-corruption mechanism in place to ensure that all funding is correctly spent. We support this through approaches such as TRIAMS—the tsunami recovery impact assessment and monitoring system. The purpose of the TRIAMS initiative is to assist governments, aid agencies and affected populations in assessing and monitoring the rate and direction of the post-tsunami recovery throughout its duration. In the process, the system helps governments, aid agencies and donors to be accountable for the end results of their efforts. Is the recovery effort achieving the desired results? Are the results distributed equitably? 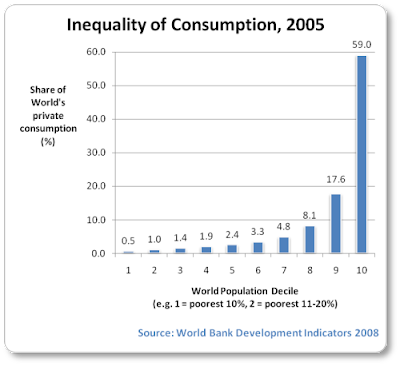 Where are the priority gaps? These are some of the questions TRIAMS seeks to answer. My colleague Robert Ondrusek who is based in Bangkok, is running the TRIAMS programme and was also at the meeting. So the meeting in Bangkok was the first of its kind to capture the lessons learned to share with all organisations and donors to record what went well, what needs to be improved, and mistakes we should never repeat. We also plan to come up with a practitioners’ manual for future mega-disasters so that operations managers and administrators from all around the world can have the best information at their fingertips when disasters strike. It was a moving experience to hear presentations from each country and to note the selfless service given by so many dedicated volunteers and professionals, some of whom I wrote about in my second to last posting, such as the 73 year old Indonesian grandmother who is a volunteer for the Indonesian Red Cross. The regional Tsunami meeting also discussed the proposed one hour Discovery Channel documentary which is underway. This documentary is designed to show the world how their money was spent and to hear the stories of the Tsunami affected people. Two of the best Tsunami Champions: Kuntoro Mangkasubroto,(right) Minister for Tsunami, Indonesia. Dr. Kuntoro led the world's best relief and recovery process ever, by setting up an unparalled coordination mechanism through a one-stop-shop approach where international players working in Indonesia engaged with one government agency which included Immigration, Customs, Foreign Affairs, Finance and all other Govt. departments, to ensure international aid reached the people quickly. And,right,Jerry Talbot, Special rep. to the Secretary General of the International Federation of Red Cross and Red Crescent Societies. Jerry worked three years in the Maldives before taking on his current position. 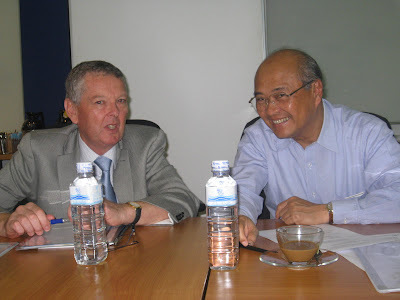 I was delighted my boss from Geneva, Jerry Talbot from Onga Onga in the Hawkes Bay, New Zealand, was at the meeting. Jerry and I first worked together in Bangladesh after the war between Pakistan and India when Bangladesh gained its independence. We also worked in Vietnam, Afghanistan and in Maldives in the early days of the Tsunami. Jerry has been my boss thrice and I his, once. Such is the swing of the managenment pendulum in our organisation. Thank God we have fairly flat structure in the Red Cross where we have a team approach to our work, and where situational leadership is encouraged. I am rambling on. My batteries in my computer are almost exhausted and also my own batteries, as we begin the descent to Jakarta. Its late Saturday morning so I look forward to a relaxing weekend with my family, Naila, and boys Ablai and Mahdi. Bob. Saturday 26 October 2008. When I landed at the Robert Scott Glacier in 1970, I recall thinking, "what is under the thousands of feet ice I am standing on." Thirty-eight years later I have an answer. At this very moment, perhaps the last great Antarctic expedition - to find an explanation for why there is a great mountain range buried under the White Continent. 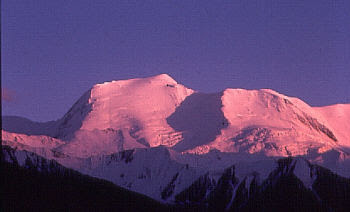 The Gamburtsevs match the Alps in scale but no-one has ever seen them because they are covered by up to 4km of ice. Geologists struggle to understand how such a massif could have formed and persisted in the middle of Antarctica. Now, an international team is setting out on a deep-field survey to try to get some answers. The ambitious nature of the project - working in Antarctica's far interior - has required an exceptional level of co-ordination and co-operation. "You can almost think about it as exploring another planet - but on Earth," said Dr Fausto Ferraccioli from the British Antarctic Survey. "This region is a complete enigma. It's in the middle of the continent. Most mountain ranges are on the edges of continents, and we really can't understand what these mountains are doing in the centre." 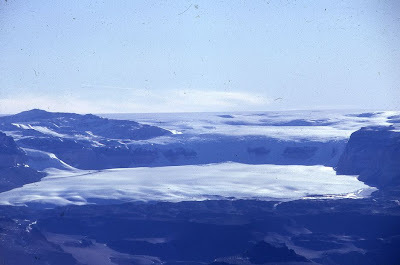 The AGAP (Antarctica's Gamburtsev Province) project will establish two camps from where the team will map the subglacial range using surface and airborne instruments. ng to seismic waves passing through the range, scientists can probe rock properties deep in the Earth. 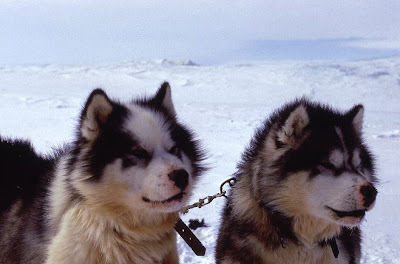 The Gamburtsevs were discovered by a Soviet team making a traverse across the ice in the late 1950s. The rocky prominence was totally unexpected; scientists thought the interior of the continent would be relatively flat. "There are two easy ways to make mountains," explained Dr Robin Bell, from the Lamont-Doherty Earth Observatory, who is a lead US researcher on the expedition. "One is colliding continents, but after they collide they tend to erode; and the last collision was 500-million-plus years ago. They shouldn't be there. "The other way is a hotspot, [with volcanoes punching through the crust] like in Hawaii; but there's no good evidence for underneath the ice sheet being that hot. "I like to say it's rather like being an archaeologist and opening up a tomb in a pyramid and finding an astronaut sitting inside. It shouldn't be there." 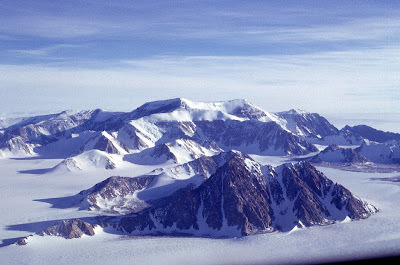 The mountains are believed to have been a key nucleation point for the vast East Antarctic Ice Sheet. It is thought that as Earth's climate cooled just over 30 million years ago, the snows that fell on the mountains produced mighty glaciers, which then merged to form one giant spreading ice-mass. A better understanding of these events could give clues as to how Antarctica might evolve in the coming centuries if, as expected, the Earth continues its current warming trend. The aerogeophysical survey of Antarctica's Gamburtsev Province (AGAP) is a flagship endeavour of International Polar Year - the global science community's concerted push to try to answer the big questions about the Earth's northern and southern extremes. The challenging nature of the expedition has required that expertise be drawn from across polar community. Supplying such remote camps is a major logistical exercise; working in them - at temperatures 30-40 degrees below zero Celsius - is bound to be physically demanding. 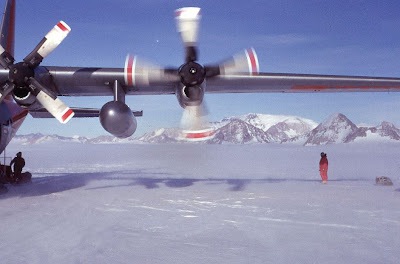 Two survey aircraft will sweep back and forth across the ice to map the shape of the mountains. The planes will be equipped with ice-penetrating radar and instruments to measure the local gravitational and magnetic fields. Information on the deeper structure of the Gamburtsevs will come from a network of seismometers that will listen to earthquake signals passing through the rock from the other side of the globe. "We'll map everything from the detailed ripples on the surface of the ice sheet down to the temperature structure hundreds of kilometres in the Earth, so we'll have everything from the layering in the ice to what the nature of the rocks are," said Dr Bell. Another important aim of the project is to find a place to drill for ancient ices. By examining bubbles of air trapped in compacted snow, it is possible for researchers to glean details about past environmental conditions. Not only can they see concentrations of carbon dioxide and methane - the two principal human-produced gases now blamed for global warming - but they can also gauge past temperatures from the samples. Somewhere in the Gamburtsev region there could be a location were it is possible to drill down to ices that are more than a million years old. This is at least 200,000 years older than the most ancient ices currently in the possession of scientists. The expedition will take some two-and-a-half months to complete. So 38 years on, this aging Antarctic explorer will have his curiousity satisfied when the results of th eexpedition are made public. Below are some photos I took in the good old days when we travelled by dogs. 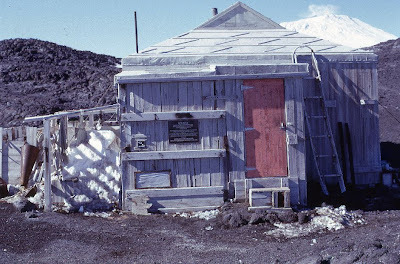 Shackleton's Hut at Cape Royds. Thanks to Jonathan Amos for permission to use some of his data. 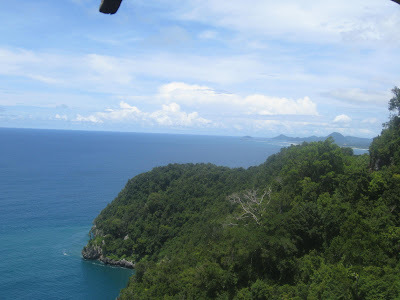 I am currently travelling in the northern most part of Indonesia, Pulau Weh ( the small island in the top left-hand corner) and the province of Aceh, which was devastated by the 26 December 2004, Tsunami which killed 127,000 people and the bodies of another 116,000 have never been found. A quarter of a million poeple killed in seconds. In my travels where I talk and motivate the volunteers and staff, inspect projects and plan for future programmes, I hear so many gut-wrenching stories and the work of unsung heroes, many of them Red Cross volunteers. Here are two stories of Nuraini a Grandmother and Nasir, orphaned by the tsunami. Despite having experienced profound tragedy, Red Cross Red Crescent volunteer Nuraini (left) is determined to help others. 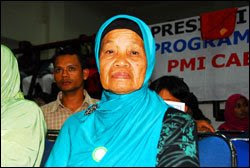 After losing four children, 11 grandchildren and her home to the 2004 tsunami, 72-year-old Nuraini and her husband used their pension to build a kindergarten in Merduati village, Banda Aceh. “Children should begin their education early, which is why we started this kindergarten,” she says. When she is not running after the children at her school, Nuraini teaches cooking and traditional handicrafts to other women in her village as a community facilitator for a psychological support programme (PSP) run by the American Red Cross and Indonesian Red Cross. “It is important to share your knowledge and skills with others, so that they can grow and learn too,” she says, adding that many women use these new skills to earn additional income for their families. Nuraini also sheepishly admits that she has a hard time sitting still and is constantly looking for new projects to keep her busy. Nuraini is one of 1,260 community and school PSP facilitators in the 137 communities and 154 schools in Banda Aceh, Aceh Besar and Aceh Jaya targeted by the programme. Nuraini and her fellow volunteer facilitators play a critical role in helping their communities to recover from the emotional toll of the tsunami. The volunteers identify psychosocial needs in their communities, and design and implement activities to meet these needs. These often include informal schooling and tree planting to help re-establish a sense of place in damaged or resettled communities. Facilitators receive extensive training in project planning and technical skills, such as psychosocial first aid, to help them carry out their roles. As the PSP programme comes to an end in Banda Aceh and Aceh Besar, the American Red Cross and PMI are working with the facilitators to enable them to continue to provide psychosocial support to those in need. 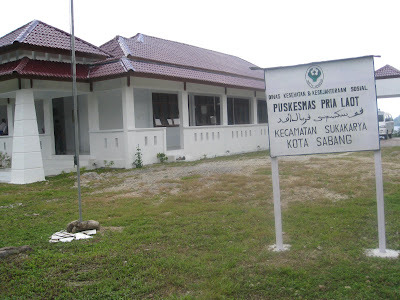 The Red Cross Red Crescent is now expanding its PSP activities into new communities in Aceh Jaya. Nasir (left) found himself in the media spotlight in December 2007, when he became the recipient of the 100,000th house built in Aceh province three years after the tsunami had left around half a million people homeless. 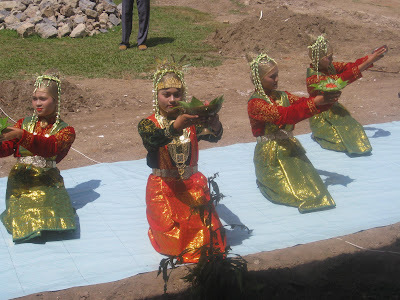 The 14-year-old orphan was interviewed on local television at the ceremony to hand over the keys to his new pale green home in Tanoh Manyang village in the Teunom region of western Aceh. He may be the star of the community but, a few months on, the media circus has moved on and he’s still facing life without his parents, who died in the disaster. “After the earthquake, I went closer to the beach. Then I saw a big wave that dragged me away. Although I was only half conscious, I was able to swim, but I never saw my parents again,” he explains haltingly. Nasir now lives with his older sister in a settlement of 140 houses, which were constructed from scratch by the British Red Cross for tsunami survivors who lost their land in the disaster. 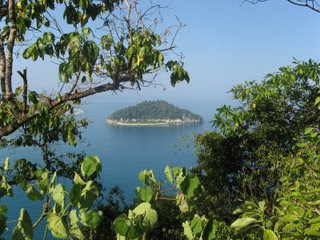 Some of them had previously inhabited a tiny island in the middle of an estuary, which was swallowed by up the waves. Today there is a lively coffee shop and brightly-coloured flowers grow in the front yards lining the main street. People are slowly furnishing their new homes, although few have enough money to replace everything they lost in the disaster. Nasir must wait until he reaches the age of 17 before he becomes the legal owner of his house. Until then, his financial affairs will be managed by Nourdin, his uncle, who has been declared Nasir’s official guardian by the local sharia court. There, Nourdin signed a declaration confirming his responsibility to manage the assets given to his nephew by the British Red Cross until Nasir becomes an adult. 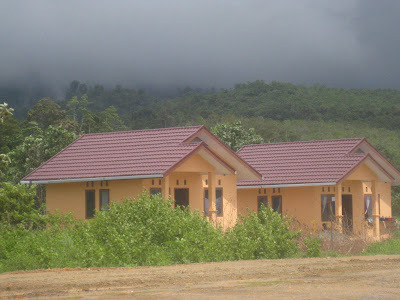 The same process was repeated for the 348 orphans who received homes and cash grants under the Red Cross policy of providing extra support to groups left particularly vulnerable by the tsunami. Nasir recently received a lump sum payment of around 520 Swiss francs to help with his education. Some of the money has been spent on books, pens and other stationery, and he has also enjoyed a bit of extra pocket money. 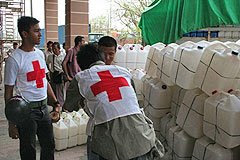 Thanks to the International Federation of Red Cross and Red Crescent Societies for use of photos and information above. Can anyone actually wait for the release of this or is it just turning into a physical impossibility? The Boyfriend and I have been looking round the internet for anything that comes to be leaked. We've heard a few and to be honest sometimes it just smacks that impatience is a disease made ever worse by the quickening access to everything in the world excelerated by the internet. 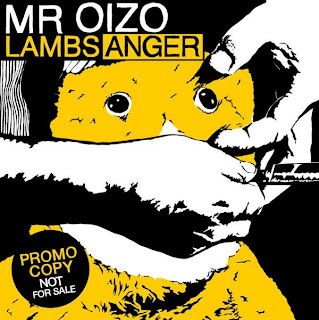 Pop Mr Oizo into the Hype Machine and you'll see a selection of various leaked bits. But I'd like to share this. It actually makes my skin want to burst. Or is Seasick Steve really on the Paul O'Grady Show? Nightmares about Hollyoaks. Mistaking the sudden onset of tinnitus for the adjacent apartments fire alarm. And seeing Seasick Steve chatting to Paul O'Grady and bursting into a bit of improvisation with the once lady man himself! I'm going to have a lie down. 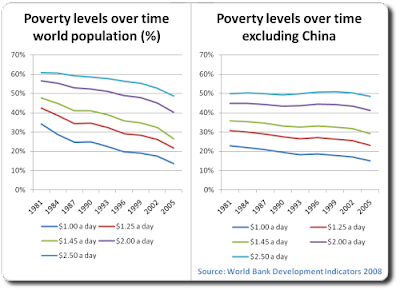 The poor getting poorer - highly motivated and depressed. 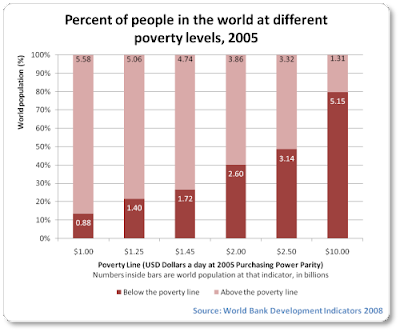 I got considerable feedback on my last posting written about the impact the current global recession is likely to have on poverty. 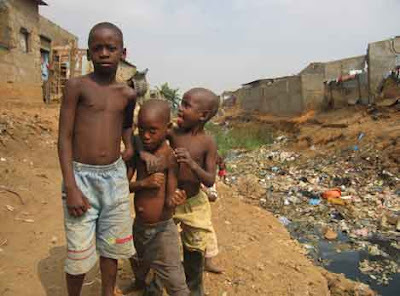 According to UNICEF, 26,500-30,000 children die each day due to poverty. And they “die quietly in some of the poorest villages on earth, far removed from the scrutiny and the conscience of the world. Being meek and weak in life makes these dying multitudes even more invisible in death." Having lived in Afghanistan 1993-96, Central Asia from 1996-1998,Bangladesh 1999-2000, India 2001 -2006 and since September 2006 Indonesia, it has been 15 years of working with disasters and poverty. Before that another 20 years in Africa and Asia. It is a scourge, it is a shame, it is a responsibility we all have to share. 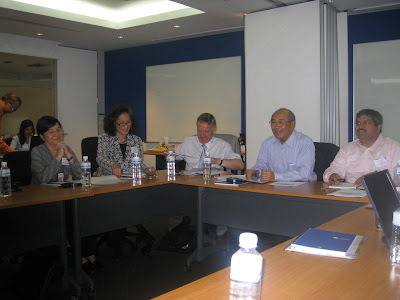 I have just returned from a Asia Pacific meeting in Kuala Lumpur where our heads of delegations and Asia and Pacific got together to share experiences and plan our programmes for the coming year. I was so moved to hear first hand from Bridget, who ran the huge cyclone operation in Myanmar, speak of the thousands who died, and the work of the Myanmar Red Cross volunteers. Many of them lost their homes, some family members, but they continued to work 18 hours a day for months while they distributed tents, food, clothing and bedding, and others provided life saving medical care. The media hardly reported this but rather focused on politics. Then Carl spoke of the sense of helplessness he felt when the massive earthquake struck China some months back and he asked our regional logistics unit in Kuala Lumpur to provide 100,000 tents. It took 70 charted 747s, Jumbo jets to get them into the effected area. Igor and his team in KL worked night and day while the Chinese Red Cross volunteers worked on rescue, medical help and distribution of relief goods. The first hand stories from Bridget, Carl and Igor motivated me even more to reach out for those who are the most vulnerable. Yesterday I met the Chairman of the Indonesian Red Cross, Mar'ie Muhammad and he said " Bob, there are millions of people in Indonesia being affected by the rising fuel prices, rising food prices, and now it is being compounded by the current economic recession." We have to reach out to these people and do something immediately. " So the Indonesian Red Cross is now doing an assessment and based on that, we will target the worst affected. But I believe the problem will be massive. It is an honour to work with a man of courage and commitment like Mar'ie Muhammad, who is a former Minister of Finance. I have travelled with him in the Tsunami affected area, through the streets of Jakarta during severe flooding, and the manner in which he stops and talks to Mothers who have lost their homes, children who are grieving is to witness a man who cares about his people, and his country. Leading the Indonesian Red Cross with its million volunteers, Mar'ie Muhammad, millions of vulnerable people are being assisted to improve their lives annually throughout Indonesia. But what depresses me deeply, is when I read the BBC website this morning and saw the worsening economic crisis, and how it will have a dramatic people on the poor people in Indonesia who struggle to exist. In a few minutes I will be leaving Jakarta airport to Aceh, which bore the brunt of the Tsunami on that fateful day in December 2004. 127,000 bodies were found and another 116,000 bodies were never located. Our work in rebuilding the lives of the 1 million affected people continues and for the next four days I will be inspecting the outstanding work done by the German Red Cross in building 1000 houses, restoring livelihoods, water and sanitation, ambulance services and community preparedness programme. The Red Cross has built 40,000 houses and has spent approximately 1 billion US dollars on relief, recovery and rehabilitation. In Aceh, the Government, the Red Cross, the UN and many other NGOs have built back better and life in Aceh has returned to normal, but the scars are still there. Sometimes emotion needs to followed up with action which we are doing in Indonesia, but it is also useful to look at poverty statistics and facts. I thank Anup Shah for allowing me to use his well researched figures. For whom the bell tolls ? 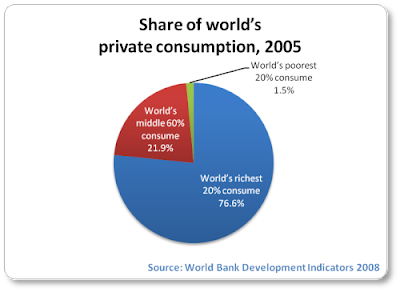 Global economic recession will kill more children. A victim of poverty. 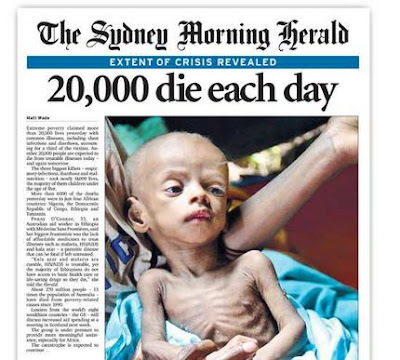 One of at least 20,000 children dying a day of malnutrition. Someone passes wind in the US, and the rest of the world is feeling the economic blast from of the summits of Pamir mountains to the shores of the Maldive Islands. Reliable statistics are now predicting that the 20,000 to 30,000 children dying a day from malnutrition and disease will increase rapidly as the global recession bites. After another day of gut-wrenching drops on world markets, finance chiefs of the world's major economies have pledged to take decisive action and work together to stem the escalating financial crisis.Reeling from the loss of trillions of dollars of wealth, investors worldwide had pinned their hopes on decisive action from the Group of Seven major industrialized nations. Robb wrote some time ago, "I battle with myself, and have fought many battles within myself, yet I return here to be reminded of my relative comforts in life from part of your writings, and entertained and enriched by others." I too battle with tensions, constraints and problems facing the world which have been enhanced by the worsening global economic crisis. 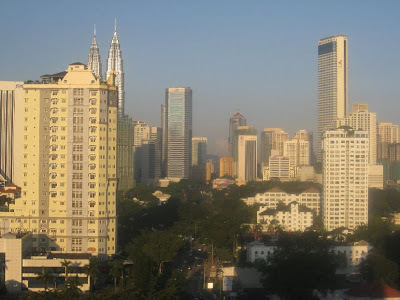 I am sitting in the relative comfort of my Hotel room in Kuala Lumpur reflecting on the last few weeks of hectic travelling. Outside my room the Twin Towers and other tall building drape the skyline. There were other Twin Towers that are no more. The financial crisis is hurting so many, especially the most vulnerable people with rising fuel and food prices, pressure on escalating accomodation rentals. Many will move from rented appartmets to shacks, shacks to cardboard and bamboo huts, or in Bangladesh and India, the millions of pavement dwellers will grow. John Donne, the 17th century English poet who wrote no man is an island entire of itself was gravely ill at the time. It is a theme borrowed by John Steinbeck. I believe he was saying that we are all equal as human beings. The closer you get to dying the closer you get to living. I have seen a lot of islands and people lately in my travels and in my work and I have come to realise that against the shallow world of rationalism, the person is ever an affirmation of mystery. We have no way to know in advance the contributions of a person’s potential. No one is useless! Just as there is a mystery about what the future holds, there is a mystery about what the future contributions of any one person may be. Children living life on the edge of starvation. I recently came across a book called Night, which restored my faith in humanity. Elie Wiesel's powerful story tells of pain and suffering experienced by a young Jewish boy during the Holocaust. 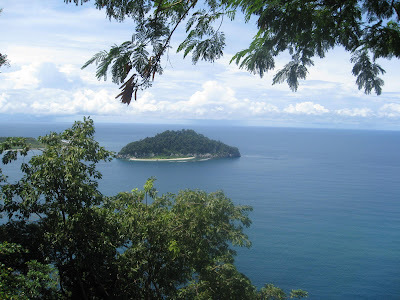 The story befits John Donne's famous quote, "No man is an island . . . Any man's death diminishes me, because I am involved in mankind; and therefore never seek to know for whom the bell tolls; it tolls for thee," in that the sharing of a common culture and the subsequent feeling of belonging helped the prisoners to survive the horror of the concentration camps - the Holocaust. as if a promontory were... Any man's death diminishes me, because I am involved in mankind; and therefore never seek to know for whom the bell tolls; it tolls for thee." by John Donne applies to the book. This sense that everyone is a part of the whole is reflected in Night, in the following ways: the sense of belonging together, their common religious beliefs, and unity among the Jewish people. All of these show how no man is in fact an island, and that each person, no matter who he/she is, is important. Clearly the notion that "no man is an island," is supported by the fact that Elie and the other characters in the novel, such as Mr. Wiesel and Stein of Antwerp, survive by having a sense of belonging. In New Zealand, the Maori have "Turangawaiwai", a place to belong, a place to stand tall. That sense of being Jewish with others who share a common culture is a strong binding feeling. It was this feeling of strength and belonging that helped Elie and the other prisoners survive the terrifying horror of the camps; as Elie says, "Our fear and anguish were at an end. We were living among Jews, among brothers...". No man is an island was evident even to the point of risking ones life for another. This is shown when the French girl goes out of her way to give Elie some bread after being beaten; "Saying those few words to you was risky, but I knew you wouldn't give me away..."(Wiesel 51). This shows the sense of belonging, because she had forged papers that proved that she was Aryan, though she was really Jewish, and if the authorities were to find out that she was really Jewish, she would have been killed. This is an example of the belonging between people during the Holocaust, because there was trust between them even though they didn't know each other. Without a doubt, their religious beliefs also played an important part in every man being a piece of the whole..".every man is a piece of the continent, a part of the main...." This quote is shown throughout the book when the prisoners come together to pray, "The service ended with the Kaddish. Everyone recited the Kaddish over his parents, over his children, over his brothers, and over himself. "(Wiesel 65). The previous passage also reflects "Any man's death diminishes me, because I am involved in mankind; and therefore never seek to know for whom the bell tolls; it tolls for thee." This is when they pray for all the losses of lives and themselves. Even though they don't know all the people who died, the fact that people of their own faith were killed, diminishes them. There are times throughout the book when the elders tell the prisoners to never lose faith, thus giving them hope to survive. This shows how the very religious beliefs of the Holocaust victims in Night applies to the quote by John Donne. Certainly, the sense of being unified gave them strength, for there is more strength in numbers. This feeling of unity even though the atrocities were so hard, was a strengthening feeling that helped them survive the camps. An example of this unity is when the prisoners were running through the snow during a forced march. They had already covered forty two miles, the officer finally gave the order to rest. After having run as one body, Elie stated "We sank down as one man in the snow" (Wiesel 82), although literally they were thousands of people, Elie says that they sat down as one man. This re-states the idea that. "..every man is a piece of the continent...."
In conclusion, the book Night is a powerful story that tells of pain and suffering, and in the midst of all this, the prisoners find each other as support through this atrocity. People are connected to something bigger than themselves as John Donne states: "every man is a piece of the continent, a part of the main..." and this becomes clear throughout the novel in the sense of belonging, religious beliefs and the sense of being unified. Elie's hope in writing this book was to enlighten and unite mankind in a hope that this would never happen again. It's a crying shame the owners of Freddie Mac and Fannie Mae had no sense of history beyond their own complacency and greed. I look out the window at the Twin Towers in Kuala Lumpur and think of Elie's sense of unity and compassion that the world needs at this point in history. Like the jetty on Nias island, Indonesia, above, most of us are wondering where it will lead too. Some of us will lose value on our houses, drop a few thousand dollars on investments, but try to think of ways of helping those who will be living on the pavements because of greed and mismanagement on Wall Street. The bell is tolling for you to do something now, for none of us are islands unto ourselves.